Malvern is a small settlement on the junction of Malvern Road and Felton Road in Whiteside County, Illinois. It lies just off the Lincoln Highway, a celebrated pioneer trail linking New York and San Francisco. The landscape is principally flat with extensive corn and soya bean farming where once buffalo grazed the prairie, alongside savannah and woodlands. 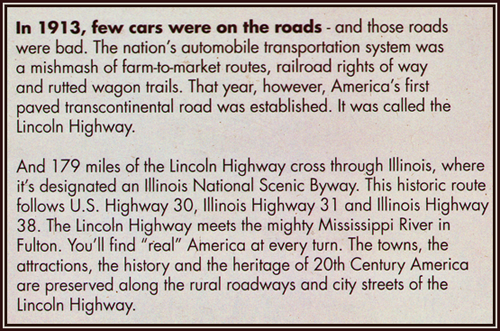 The Lincoln Highway comprises a series of interlinked roads that once formed a major route west for horse drawn wagons and later motor vehicles. Along this route four Malverns are situated, each within a few miles of the historic trail. Malvern Illinois lies about 5 miles from the Highway 30, which is part of the Lincoln Highway. Today the wagon trail and later trans continental road is replaced by a major interstate highway nearby. 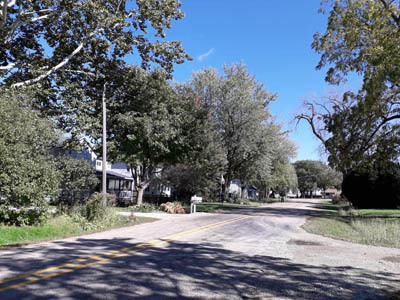 Just east of the Mississippi River, Morrison is the nearest town now by-passed by the interstate. Malvern to the north-east falls within its jurisdiction. Arriving at the heart of Malvern through a landscape of corn fields you are confronted with a substantial residence on the Malvern and Felton roads junction identified above. This is the old general store but has long closed its retail shop. A dozen or so houses are scattered nearby. 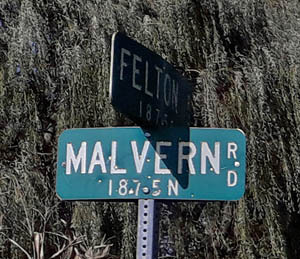 If you then follow the Felton Road from the junction for about half a mile, Rock Grove and Elm Road lie on the right near the bridge over the creek. Malvern Mill lies at the junction with Elm Road and the cemetery lies along Rock Grove. The mill dates from the 1850s and is named Appel Mill after an earlier owner. It was rebuilt in 1858. Today it is an historic protected building but no longer is use as a mill. In the 19th century when Malvern was first established it was substantially busier than what we see today however. The township of Malvern dates from the 1870s when a post office was set up by William D Hayes, the first post master. For 8 years he was also the local Justice of the Peace. His ancestors had come from England towards the end of the 17th century. He originated from Chester County Pennsylvania, which is where another Malvern exists also on the Lincoln Highway route west. It is quite likely that he named the new township after his old haunt. Accompanying William D Hayes was Henry E Horning, a carpenter. After returning for 2 years to his home country at Worcester (he was born in 1839 in Montgomery Pennsylvania where there is an unincorporated Worcester township) he came to Malvern Illinois and traded in medicines. About that time there were blacksmiths, two retail stores, and soon after a school and a church. In 1888 a Sunday school is recorded with 47 members. The church itself was planned and built in 1896 on grounds donated by a William Detra. Initial funding was with $450 pledged; all outstanding debt had been cleared by 1901. The Evangelical Brethren Church stood at the road junction near the retail store. It was an attractive white gothic style building with a willow tree as a backcloth. 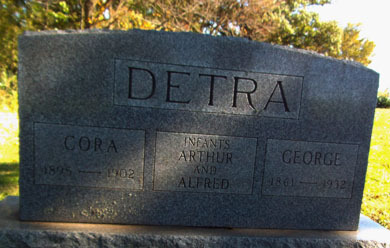 Some of the Detra family can be seen recorded on graves in the local churchyard - see picture above. By the 1960s Malvern was declining and only a single store and the church remained, apart from domestic and agricultural buildings and the mill. The post office had ceased as early as 1902. Eventually the store closed and the church was pulled down. Today a visitor could easily drive through without realising and a pedestrian is unusual to say the least. When exploring the locality do exchange greetings with local residents before checking out the mill and cemetery up the Fulton Road. In the Rock Creek cemetery as it is known, you will find many family's graves back to the 1860s, underlining when Malvern was a thriving township. In the picture Cora chats with local residents outside the former general store. The young lady has a goody bag from Great Malvern UK. Other gifts (books) from Great Malvern are deposited at the Morrison Library for all to see.